Sorry, there are only 2500 tickets of that type still available. Sorry, there are only 2500 tickets left for this event. 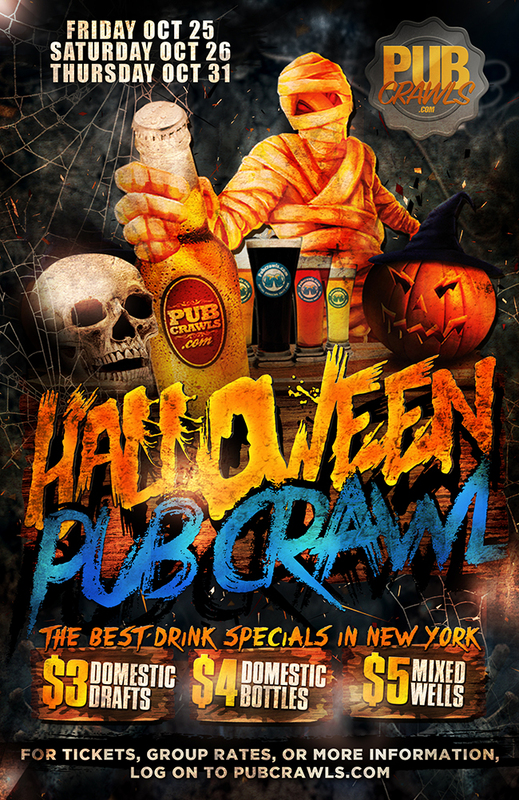 Access for 1 (one) to the New York City Halloween Pub Crawl events on all 3 days. Access to ALL participating venues. Access for 1 (one) to the annual New York City Halloween Pub Crawl on Friday October 25. Access for 1 (one) to the annual New York City Halloween Pub Crawl on Saturday October 26. Access for 1 (one) to the annual New York City Halloween Pub Crawl on Thursday October 31. You've probably tested the waters with a couple fall festivals, possibly dabbled in a couple Oktoberfests. But now, you're ready to dive head first and take the plunge into the real October festivities, and if you're a real, don't give a damn, want to have the greatest night every night, thoroughbred New Yorker - you know there is no better night than Halloween. This Halloween will be no exception - the 2019 Halloween pub crawl is one of the most anticipated events of the year. What is the pub crawl you ask? Imagine the world's sexiest people in the most outlandish costumes, crawling the streets of Manhattan on the best party holiday of the year. New York City is known as the city that never sleeps. Halloween is certainly the one weekend of the year that sheds light on this famous phrase. Rejoice with us as we scour the city, visiting the best pubs in the Big Apple. We've once again added, even more, bars to our list that scale all of Manhattan, so you'll be able to truly experience the magic and wonder of the greatest city in the world on the most exciting night of the year, Halloween. Crawl the top rated venues in the world's biggest urban playground and witness what New York City has been buzzing about since last year's Halloween bar crawl. Bring your friends along for the ride, because let's face it, the legendary moments you have during the pub crawl only matter if your squad is there to witness it with you. What can be better than spending your Halloween with amazing friends, great drink specials, and the most ridiculous costumes in the world? Nothing! The weather may be cooling down but the parties are just beginning to heat up. Witness for yourselves the circus that is organized in the streets of Manhattan during Halloween weekend by securing your official pub crawl tickets today. The FULL MAP will be distributed to all participants at the check-in venue. Over 5 neighborhoods to crawl including the West Village (parade route), East Village, Chelsea, Murray Hill, Lower East Side, & more! Featuring the city's best bars and of course - drink specials until 4 AM! !